An ONC report provides insights into the challenges and opportunities presented by current practices. There is a lot riding on a patient's ability to review and retrieve health records electronically. In truth, the health care industry has invested a lot of resources and energy into laying the foundation for improved access to better engage patients and promote information sharing. A recent US Government Accountability Office report—"Health Information Technology: HHS Should Assess the Effectiveness of Its Efforts to Enhance Patient Access to and Use of Electronic Health Information"—notes that since 2009, Health and Human Services has spent more than $35 billion on HIT. Yet a recent report from the Office of the National Coordinator for Health Information Technology (ONC)—"Improving the Health Record Request Process for Patients: Insights From User Experience Research"—reveals that patients still don't have easy access to their health data. 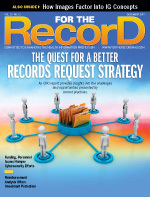 Following an in-depth review of 17 consumer experiences along with an analysis of medical release of information from 50 large health systems and interviews with key industry stakeholders, the report suggests that the industry has a long way to go in terms of improving user experience as it relates to medical records requests. "ONC released this report to highlight the current challenges patients face in accessing their health information electronically," says Lana Moriarty, ONC's director of consumer eHealth. "We set out to learn more about how and why people access their health information and where there might be opportunities to leverage HIT to improve the process and experience for patients." Providing a bird's eye view of the current state of affairs, the report details the typical records request process based on stakeholder feedback. Findings revealed that health data requests typically start with a specific trigger such as a health crisis, change of location, or a pending appointment with a specialist for a second opinion. The consumer then contacts a provider's office to determine how to access or send their records. Typically, this process entails filling out an authorization form, a step in the process where requirements vary widely based on the provider. Once the request is submitted, consumers are often in the dark about the wait period, which can be up to 30 days under HIPAA rules. During this time, a health system receives and verifies the request by confirming the requestor's identity. Once verified, the report found that fulfillment was surprisingly antiquated, often entailing submission of paper records by fax or mail or the issuance of a .pdf file on a CD. Don Hardwick, vice president of client relations and account management with MRO, agrees with the report's assessment of current patient frustrations. "As a provider of release of information services, we hear the same things. Patients are trying to get information either for themselves as a historical document to better direct and understand their own course of care or to share with consulting physicians for follow-up treatment," he explains. "There are delays and frustrations that occur not only due to immediate access but also in verifying the legitimacy of the request from the patient." The good news, according to Moriarty, is that HIT advancement should improve the outlook going forward. "While innovative solutions like APIs [application programming interfaces] will in the near future allow for patients to access their health information easily and electronically, we felt this report was needed to shine a light on the current state of patient access to health data and call upon stakeholders—tech developers, health systems, and others—to improve the process today for consumers." Diane Ferry, MS, RHIA, president and CEO of Star-Med, agrees, adding that "utilizing patient portals has great potential for improving access to health information records." The challenge for care providers, she says, is to make those portals more easily available to patients. Simply put, the report found that patients do not have easy access to the health data they need. "While online patient portals provide some information, it often is not all the information or the level of detail of information that the patient's doctors need for continuation of care," Moriarty explains, adding that the medical record request process is often confusing and frustrating for patients. • receiving nonuseful formats such as paper and CDs. Moriarty notes that the study also found that HIM department staff face challenges and pain points when processing individual requests. "By looking at both the consumer and health system experience with this process, we found that there are shared needs and that a patient-centered record request can benefit both consumers and health systems," she says. Hardwick says that HIPAA, while trying to facilitate greater patient access, has also created stumbling blocks for patients as far as privacy, security, and protected health information (PHI) disclosure management are concerned. "The letter of regulations stipulates the Minimum Necessary rule has to be applied," he explains. "So, when a patient has designated something specific be delivered, MRO, as a release of information services provider, can't release anything beyond what the patient has asked for—realizing that an entire record can be minimum necessary. We have to follow the limitations the patient has authorized." Therefore, the vendor's attempt to provide secure, private PHI disclosure to proper places takes time. "If everything detailed in HIPAA that constitutes a valid authorization and request is not present, it further delays the process, requiring communication back to the requester," Hardwick says. "Sometimes requesters are delayed in responding back regarding the deficiency, which again frustrates the patient or the requesting community." Underutilization of technology to expedite the process adds to delays, Ferry says, pointing out that paper authorizations are far too common. "This can slow down the process," she explains, pointing out that patients must often complete an authorization form by going to the health care facility. "Once a patient parks and walks to the main lobby, they need to find the HIM department, which usually resides in the attic, basement, or off campus. We have patients walking all over the health care facility looking for the HIM department. This practice diminishes patient satisfaction." Additionally, authorization forms are sometimes confusing for the requesters, and frequently an authorization form must be sent back to the requester, increasing time delays and creating another source of patient dissatisfaction. Another encumbrance for consumers is the provider's ability to deliver records when the patient's history is housed in multiple record systems such as paper records, offsite storage centers, legacy EMR systems, microfilm, and new EHRs. Hardwick points out that synthesizing all of that information creates a time delay that can be frustrating to the recipient. "If a second request for the information is received, the entire process often starts all over again," he says. "This cycle of time to satisfy a patient's needs may be up to 30 days, especially when an offsite storage facility is involved. Each one of those steps creates delays in answering patients' needs." For example, the report reveals that if a patient requests vaccination records that are more than a few years old, those documents may very well be stored offsite and take longer than expected to retrieve and process. While providers and patients face present challenges, the report sheds light on the benefits of a more streamlined electronic record request process for patients and health systems. For instance, electronic requests are quick and painless for patients, who can also choose the preferred format and delivery method and track the status of their request. On the other side of the transaction, health systems benefit from more accurate and complete request forms, faster e-verification of the patient's identity, and easy tracking and fulfillment of requests through electronic means. • providing user-friendly plain language instructions to patients and caregivers on how to request health records, what to expect, and whom to contact with questions. To help alleviate some of the frustration associated with tracking and delays, MRO incorporates two specific types of assistance. First, the organization sends a notification letter to the requester explaining the request has been received and is in process. "We also outline how to access the status of the request via the internet and how to contact by phone if they don't have internet connectivity," Hardwick explains. "While they can't see any PHI, they can see the status of their request." Stakeholders have responded positively to the report, according to Moriarty, who says patient and caregiver advocates have praised its focus on the challenges of accessing health data. "They appreciated the report's use of personas to build empathy for patients and caregivers and as tools to help stakeholders build solutions that are designed for patients," she says. For example, the report explores the challenges of a 43-year-old mother caring for her two-year-old daughter with epilepsy and a congenital heart defect. Access to records is characterized by use of spreadsheets to keep track of all the different portals, passwords, and records request processes for each doctor's office. Melissa, the mother, expressed frustration over the length of time it takes to obtain records—weeks in most cases. The report highlights how a comprehensive health record and a clear, consistent record request processes can improve the situation. Moriarty notes that HIM professionals have expressed support for the report's design solutions, pointing to their approval of electronic tools, which they believe can improve workflow. She also notes the availability of actionable tips in the ONC Patient Engagement Playbook, an online resource for providers and care teams looking to leverage HIT to engage patients. Hardwick and Ferry both believe most of the recommendations listed in the report are feasible for today's providers. For example, Hardwick is a proponent of e-verification. Regarding format, most hospitals can download a request form and have records delivered in specific formats to their website. Additionally, he says many hospitals and physician practices provide documentation encouraging patients to obtain their records. "The recommendations in this report are legitimate, but it only facilitates the request process," he points out. "The fulfillment is what causes delays. As time goes on, the request and fulfillment processes will be less cumbersome as more patient information is fully stored in the EHR. But because records reside in multiple locations today, depending how far back a request is encompassing, fulfillment delays are pervasive." Ferry notes that automated solutions already exist that address many of the issues. For instance, some solutions support a data transfer bridge between any EHR and health care facility, improving interoperability and expediting the authorization process. Technology can also be used to provide status updates to patients and requesters, improving patient satisfaction with the process. Hardwick notes that the report does overlook HIPAA's privacy and security requirements and the penalties for noncompliance. "HIPAA attempted to provide freer access while putting in place controls for privacy and security—and rightfully so. But now there are also penalties associated with not following the letter of the guidelines," he says, acknowledging that finding the right balance is a two-edged sword. "While the industry is trying to provide quick, accurate access, mistakes cause tremendous risk to the provider. The consequences of noncompliance are steep—both monetarily and from reputational harm." This cautious approach can result in delays in the release of information process, he adds. HOW WILLING ARE PATIENTS TO ACCESS RECORDS ONLINE? A recent report from the Office of the National Coordinator for Health Information Technology suggests that electronic access to patient records will go a long way toward improving fragmented cumbersome medical records request processes. While that may be true in theory, the bigger question may be: Will patients use portals and electronic means of requesting records? Recently, the Government Accountability Office (GAO) conducted research in this area, resulting in the report "Health Information Technology: HHS Should Assess the Effectiveness of Its Efforts to Enhance Patient Access to and Use of Electronic Health Information." Among its findings was the fact that relatively few patients access their information electronically when offered the option. "We found that about 88% of hospitals offered electronic access, but only about 15% of patients accessed their records electronically," says Carolyn Yocom, director of the GAO's health care team. "And for professional services, it was about 87% of providers offered electronic access and only about 30% of those patients accessed the records." Further analysis revealed that patients were more likely to access records if they did not fall into a low-income bracket and lived in an urban area. Also, larger practices achieved higher percentages of patient access and use of electronic information. • monitor test results for chronic conditions. • difficulties trying to combine records from different providers. Yocom says the research drew a correlation between use and vendors. "Some [portals] got more use than others. Depending on the type of program, the variance between vendors was anywhere from 10% to 48%," she notes. "There are a lot of choices, and they aren't necessarily all equal."